In recent years, Shuangding Town of Xixiangtang District in Nanning City has promoted special activities of “Enriching People via Industrial Development” to promote agricultural industry. Among these activities, bold industrial transformation has been made for production of bananas and watermelons in Yiping Village by combining market demand, revenue generation and other factors. Moreover, the plantation of citrus fruit has been vigorously promoted, which occupies ten thousand mu of land. Nearly 1,500 households have participated in such plantation, including 14 households living in poverty, and more locals are joining the trend. 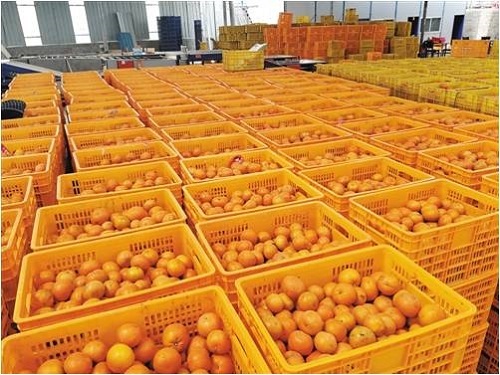 Combined with the rapid development of production of citrus fruit and the watermelon market available in Yiping Village, local authorities have transformed the watermelon market into the trading market for citrus fruit for purchasing, sorting, packaging, etc. As a platform for selling agricultural products, it attracts merchants from other cities such as Beijing and Shanghai and experiences daily trading volume of 5 million yuan.